I love questions like this because the answer is an easy one. When I first started working for a central Diocesan schools office, one of the high schools I worked with only had one Open House event. It was held on the Sunday of the week before Catholic Schools Week, and since Catholic Schools Week is the last week of January, the possibility existed that the event would be postponed or cancelled due to inclement weather. After becoming more observant of what other schools outside our immediate area were doing, I noticed that some private high schools would have Open House events during the months of September, October, November, February and March. Five events are certainly better than one, and not having an event right in the middle of Winter also seemed to provide an enlightened strategy. 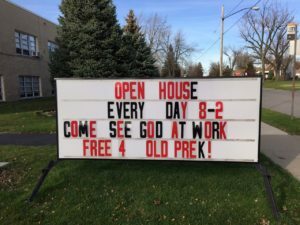 Several years into my position, I discovered an excellent text by Dan Krause of GraceWorks Ministries in Colorado Springs titled “Marketing Christian Schools: The Definitive Guide.” In it, Mr. Krause advocated weekly open house events. I thought this made a world of sense, in that there are situations that always seem to pop up and wreak havoc on a parent’s busy schedule today. A weekly open house, especially at a Catholic school, could coincide with a weekly celebration of Mass. Also notice that the weekly open house wasn’t necessarily on a Sunday afternoon or an evening. It’s during the school day. A parent can actually experience what’s going on in the school, the behavior of the children in the classroom, and the learning that’s taking place, rather than a nicely organized program in the evening when there are no students in the building, except for those that may be assisting with the event. Queen of Angels Catholic School in North Huntingdon, PA celebrates Mass every Tuesday at 1:45 in the school auditorium! It’s a great way to cap off the day, and, since all are welcome, it can provide parents of prospective students a way to showcase the difference of the school, possibly with a tour before Mass, and then staying to celebrate the sacrament of the Eucharist with the school community. Then there’s Mary Queen of Angels Regional Catholic School in Cheektowaga, NY (Note the similarity of names). The image associated with this article is at the school. Yes, they have a DAILY open house. It’s when school is in session. Novel idea, eh? They also offer a great way to market the K-8 school via their Pre-K program. 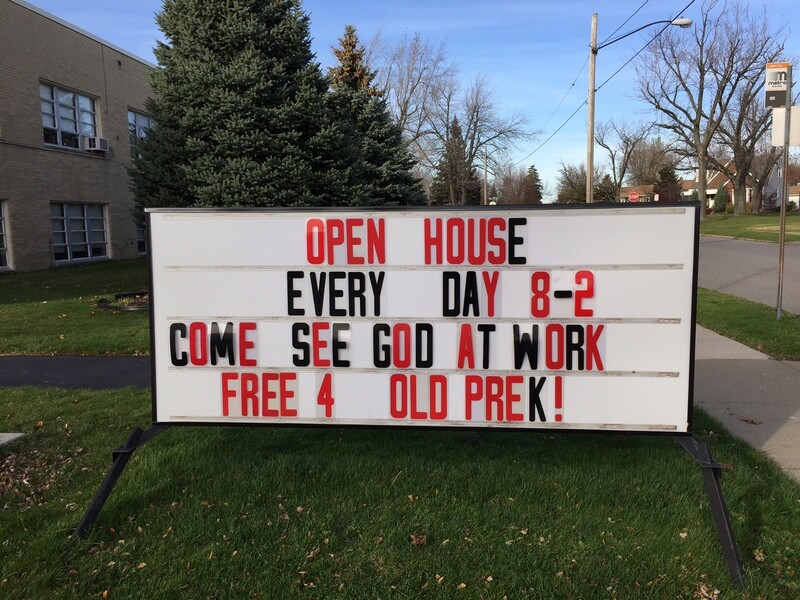 Free PreK4? As long as you budget for it, it can be done. Is Your School’s eNewsletter/iZine Mobile-Ready?